TRAVELRACKS - WORLD'S SMALLEST SURFBOARD SOFTRACKS! The 'mini-me' of Lockdown racks, we've made Curve TravelRacks - surfboard soft racks - as small as possible for travel. Losing your boards off the car roof is the last thing you want after getting them safely to the airport, but most rental cars don't have fixed roofracks which means plain tiedowns wont secure your boards effectively. Travelracks build full softrack performance into a compact size by eliminating bulky foam padding which isnt so necessary when surfboards are in bags. With Curve travelracks you can relax knowing your boards can be safely secured to almost any vehicle with a roof - without having to pay excess luggage fees! PRODUCT SIZE: A complete set of TravelRacks in handy pouch will fit the clasp of one hand - measuring just 6x4x3" and under 2lb's! LOCKDOWN SYSTEM: patented Curve 'lockdown' system uses a revolutionary single loop to 'cocoon' around surfboards and secure to vehicle roof. COMPATIBLITY: use with bare roofed vehicles (great for rental cars with no fixed racks) that have either 4 opening doors, or a combination of front doors and two rear opening windows. TravelRacks are also compatible with roofed vehicles fitted with 2x roof rails which run parallel to side of car (no cross bars required). CONSTRUCTION: each 1" webbing strap is secured by a super strong zinc cast cambuckle for ultimate tension and safety. USEABILITY: TravelRacks are configured differently than standard soft racks, so the first installation may take extra time until familiar. We recommend prior experience of using standard surfboard soft racks. CAPACITY: 1-4 short surfboards, 1-3 longboards or 1-2 SUP boards please note TravelRacks do NOT contain padding like standard softracks, so there is no padding between surfboards and vehicle roof. **CHOOSE TRAVELRACKS TO GET YOUR BOARDS FROM THE AIRPORT SECURELY** Travel safe and keep the stoke!! 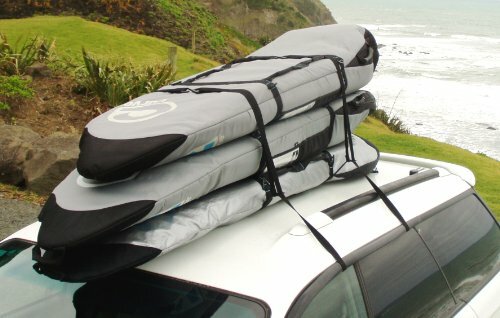 worlds SMALLEST surfboard soft racks - perfect for travel!